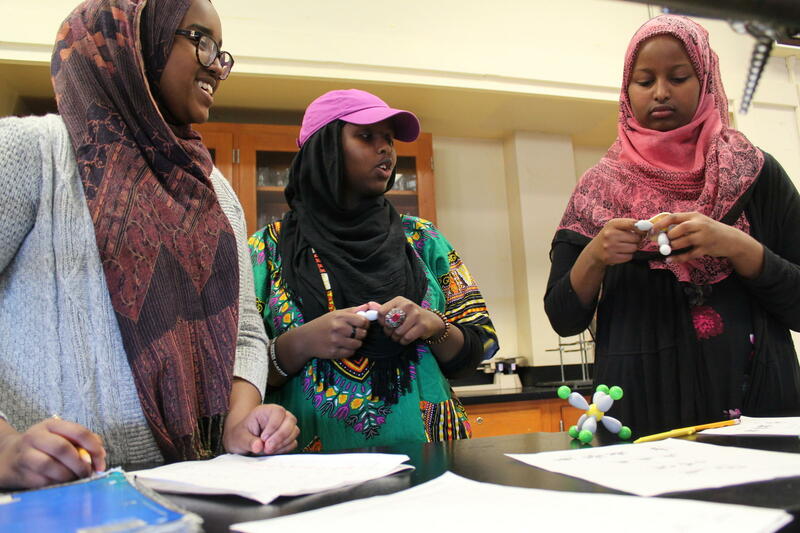 Students Bilan Mohamed (from left), Mulki Hagi and Deqa Mohamed construct three-dimensional models of molecules inside an AP chemistry class at Portland's Deering High School. For some high schoolers, AP classes can often seem intimidating. There’s the extra homework and the college-level tests. But that’s not the case inside Sarah Shmitt’s AP language class at Deering High School in Portland — it’s often tough to hear yourself talk because of the constant discussions. Instead of being focused on grammar and vocabulary, the class is now exploring issues of race. Every semester, students tackle one big, controversial topic. They gather into teams, and learn about language through a series of classroom debates. Juniors Nimko Isaac and Mae Livermore are doing online research for their upcoming debate. Both say the extra work in the class is demanding, but they love these discussions — particularly, hearing the views of students from all kinds of backgrounds. “We’re talking about Colin Kaepernick and the national anthem, and should he kneel for the flag or not. I’m interested in all those things,” Isaac says. “It’s really interesting. We have daily discussions — long, convoluted discussions — about what we’re reading and how we feel,” Livermore says. Shmitt says the discussions have also folded in more diverse points of view. Only three years ago black and African-American students were largely underrepresented in AP classes, even though they now make up about a third of the student body. That’s a common problem across the country, experts say. One of the causes is “tracking,” or assigning kids into honors or college prep classes based on their ability. Deering Junior Sulwan Ahmed says she was frustrated at being confined to lower-level classes throughout elementary and middle school after she arrived in the United States from Sudan. But over the past few years, the diversity within Deering’s AP classrooms has changed dramatically. From 2014 to 2016, the number of AP students at Deering nearly doubled. And the number of black and African-American students in those classes has more than quadrupled. One reason for this is a policy at Deering called Challenge by Choice. It says that if a student wants to take any class — even honors or AP — they can do so with no prerequisites. Officials say the policy has been in place for years, but it’s now being highlighted and emphasized to students. In some cases, the school has even done away with the honors distinction, which has led to more kids enrolling in AP classes. And some students say that because the AP classes are so engaging, more kids just want to take them. But the biggest reason that many students point to is assistant principal Abdullahi Ahmed. When he walks through the halls, he pokes and prods kids, constantly asking them how they’re doing. Ahmed is an immigrant from Somalia. And he says when he took over his job two years ago, he wanted to use his background to better connect with the growing number of immigrant families at the school. “These identities, intersectionalities I have — I’m black, I’m Muslim, I’m Somali, I’m immigrant. So this identity actually makes me relate to some of the parents,” he says. In almost every interaction with a student, Ahmed encourages them to push themselves one step further. To try out that one honors math class or maybe work their way up to AP biology in a year or two. Ahmed also directs this motivational energy toward students who might otherwise be candidates for discipline. Sophomore Adian Ali says she remembers Ahmed pulling her aside after she got in a fight with another student last year. Instead of being angry with her, though, Ali says Ahmed had a different response — one that surprised her. But Ahmed insisted — first honors English, then honors biology. And when Ali sat down with the work, she says she realized she could do it. There are some concerns being raised around the push toward AP classes. One AP English teacher says she’s concerned that some kids don’t take the AP test at the end of the year and miss out on potential college credit. Guidance counselor Libby Heselton says she’s worried about the added pressures on some students who try to take up to three AP classes at a time. Ahmed says the school is now adding more support, in the form of students from Bowdoin College who come in to help kids who are struggling. But he says he’s encouraged by the fact that students are now asking each other to take honors or AP classes together. It’s a culture that Ahmed hopes can continue to grow at Deering. This story was originally published Nov. 28, 2017 at 5:00 p.m. ET.